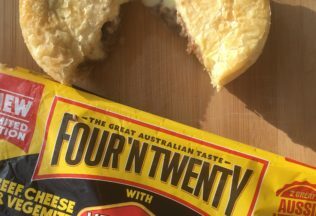 Four’N Twenty is selling a Cheese and Vegemite version of its beef pie to celebrate two major milestones achieved by both Four’N Twenty and Vegemite. Patties Foods’ Four’N Twenty marks its 70th anniversary in 2017 while Vegemite became an Australian-owned brand again when it was acquired by Bega Cheese from Mondelez International in April 2017. Mario Matchado, Four’N Twenty Marketing Manager, said the pie is an ideal way to celebrate the two achievements. “We love our Aussie mateship culture and we couldn’t be more stoked to be part of this delicious, historic partnership,” Matchado said. Four’N Twenty has a number of AFL players on board to help promote the creation including Daisy Pearce, Tayla Harris, Jess Hosking and Sarah Hosking. The Four’N Twenty’s Cheese and Vegemite pie is available now for a limited time only from Coles supermarkets. The recommended retail price is AUD $8.00 for a pack of four pies. Kellogg’s Australia will be opening Sydney’s first cereal café for one week only this month. Could ‘pea milk’ be the next big 'health food'? Foodbank has launched its largest-ever Shop and Share campaign.